LEGO Jurassic World for the Vita is exactly what you’d expect from Traveller’s Tales: fun to play, full of excellent fan service and shrunk down to size for a handheld console. Here’s our full review. There is very little left to say about the LEGO games we’ve seen in the past 10 years or so – the formula has worked for franchises Batman, Star Wars, Indiana Jones and has now come to the Jurassic Park universe. The concept hasn’t changed much over the years: it’s a mix of simple platforming, relatively easy puzzle solving (usually involving some kind of brick building) and light-hearted humor. The Jurassic World edition is no different in this regard. In terms of the overall feel however, the game feels closest to LEGO Lord of the Rings. The reason for this is partly that the game packs an entire series of films into one game experience. Just like the Lord of the Rings edition with its movie trilogy, LEGO Jurassic World doesn’t just contain levels inspired by the latest movie – its adventure is spread evenly across all four movies. The big benefit of this is that the game sticks to the (more recognizable) highlights from each of the movies, and doesn’t have to rely on obscure scenes that we’ve long since forgotten. The inclusion of the original movie is definitely the biggest draw in this regard, especially its iconic scenes that include the T-Rex chase and the raptor scene in the kitchen. The source material isn’t just used for inspiration in the game’s levels though – it’s also used in terms of the overall presentation. Of course the game still uses its LEGO look and feel, but the game also uses audio samples from the original movies. Hearing Richard Attenborough say “Welcome to Jurassic Park” sure does bring back memories, even when he’s represented as a LEGO character. This is part of what makes LEGO Jurassic World similar to LEGO Lord of the Rings, which featured audio samples from the Peter Jackson movie trilogy. 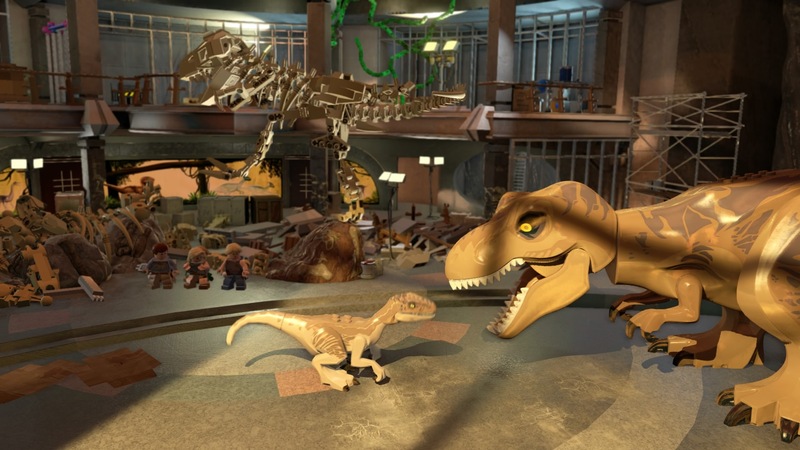 In the case of LEGO Jurassic World, the movie samples are added on to by new and original audio recordings as well, so make sure the audio fits with the re-written cutscenes – often done so for comedic effect. Something that’s new and perhaps unexpected is the ability to control some of the dinosaurs during the game. Just like many of the human characters, they all have special abilities that allow you to progress. For instance, you might be stuck in a situation where a triceratops needs to ram a gate for you – just like you would use Lex’s ability to shriek to lure a dinosaur. Aside from integrating dino controls in the main game, LEGO Jurassic World also lets you create hybrid dinosaurs, combining elements of a T-Rex with those of a velociraptor, for instance. Controlling the dinosaurs (and you can control your own creations as well) is a lot of fun, mainly because it breaks the mold a little bit. The entire package is somewhat predictable. If you like the LEGO franchise, and you’re a fan of the Jurassic Park movies – then you know exactly what you’re getting and you know you’re going to like it. If you can’t stand or have grown tired of the LEGO formula, then this probably isn’t for you. In our case… being a fan or Jurassic Park definitely helps us enjoy this game, even though it was shrunk down for the Vita. The main feature missing is drop-in, drop-out multiplayer – but everything else seems to be intact despite the limitations that come with handheld hardware. As such, we can only recommend the game to Vita owners, who aren’t getting too many AAA titles these days.